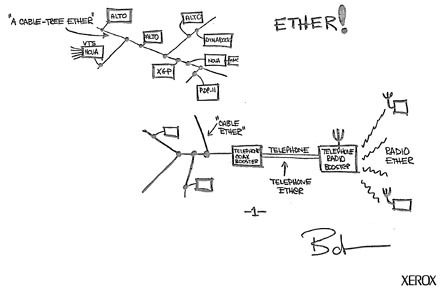 The following is a composite of sketches of Ethernet drawn by Bob Metcalfe while he was a researcher at Xerox PARC and included in the first internal Xerox memo about Ethernet. This sketch comes courtesy of Palo Alto Research Center. HERE IS SOME ROUGH STUFF ON THE ALTO ALOHA NETWORK. For reuse of this image or the full contents of the original memo contact PARC media relations at our PARC notice page. See a tap and transceiver from the Ethernet network taken from the ceiling at Xerox PARC. 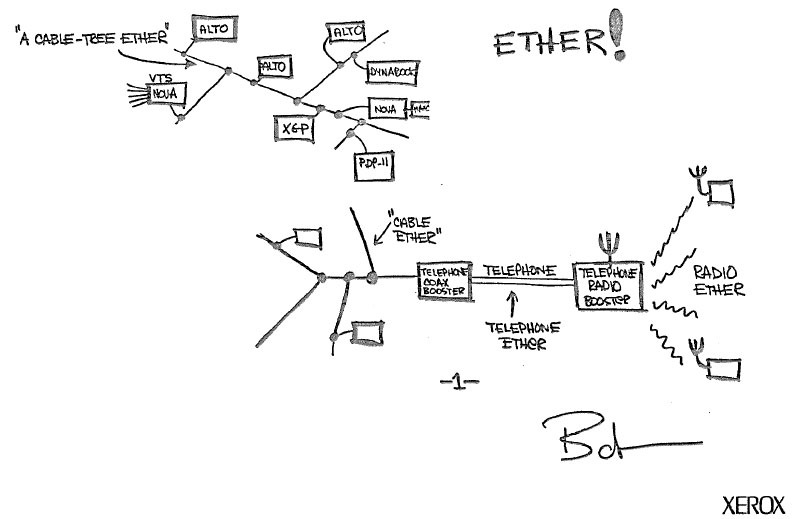 Another Early Drawing of Ethernet by Bob Metcalfe. Ethernet at 30, anniversary celebration hosted by PARC. From ARPAnet to Ethernet article by Vincent Zegna & Mike Pepper. Alan Freier's Wildflower site hosted by the DigiBarn, all about the Xerox D-Machines.